I have two people to thank for inspiring this awesome bread: Sawsan of the Daring Bakers club, and Valentina Zurkan. Look up Valentina Zurkan in google images and you will be blown away (at least I was)! Making this bread came kind of naturally to me as one who loves sculpture and paper crafts. I have never considered using bread dough in this way. My creative spirit is really buzzing after this project! I hope to do more of this form of baking in the future if I can find the time and energy...I hope to be so lucky! I used several sources when creating this recipe. 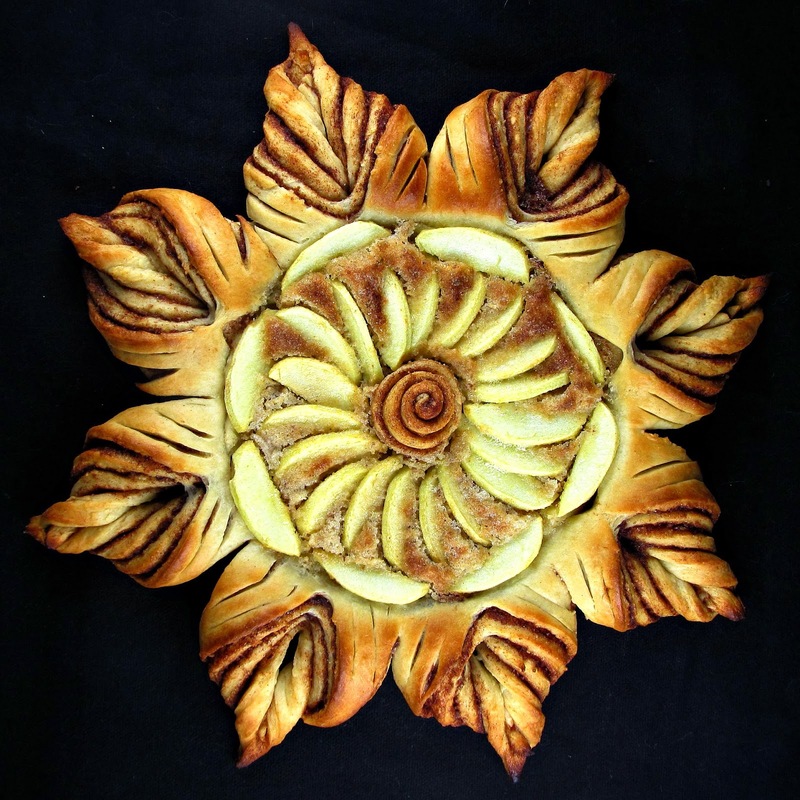 Check out this post (apple tart), this post (bread forms) and this post (daring baker's challenge/bread recipe), mash them all up and there you have it. Cream together butter and sugar in a medium bowl until light and soft. Gradually mix in the egg and the egg yolk one at a time. Stir in the tablespoon of liquid. Stir 2 tablespoons of flour into the ground nuts, then mix into the batter. Set aside. In a small saucepan, melt the butter and add water and milk. Bring the mixture to a warm room temperature. In a bowl, whisk together the water, milk, butter, egg, sugar and yeast. Set aside to foam for about 5 minutes. In another bowl whisk together the flour and salt. Stir the liquid ingredients with the dry ingredients and knead on a floured surface for about five minutes until you get a smooth dough. Place the dough in a bowl you have brushed with some oil and cover it with a wet cloth and leave it in a warm place to double in size (about 2 hours). Turn the dough out onto a lightly floured surface. Remove one large egg sized piece of dough from the mound and set aside. Divide the remaining dough into four equal parts. Roll each of the four parts into a circle about 9 inches in diameter. Spread the first round with a quarter of the butter then sprinkle with about one-third of the cinnamon and sugar. Place the second layer of dough on the first layer, repeat the spreading and sprinkling and then do the same with the third layer. Top with the fourth layer, this time only spreading it with butter. Trim the edges to create a perfect round shape (easiest if using a round plate 8 inches across as a guide). Save your trimmings. Using a sharp knife, make cuts that divide the dough into 8 triangles, leaving a half inch of dough intact at the edge. Make slits that go 2/3 of the way in the middle of each triangle. The cuts should not reach the base of the triangle nor the tip as you can see in the picture. Pull the tip of each triangle through the slits as seen above. Score the surface of the dough on any plain doughy areas to create greater detail. Roll out the egg sized round of dough to fit into the center. Spread frangipane over the center round (you won't need to use it all). 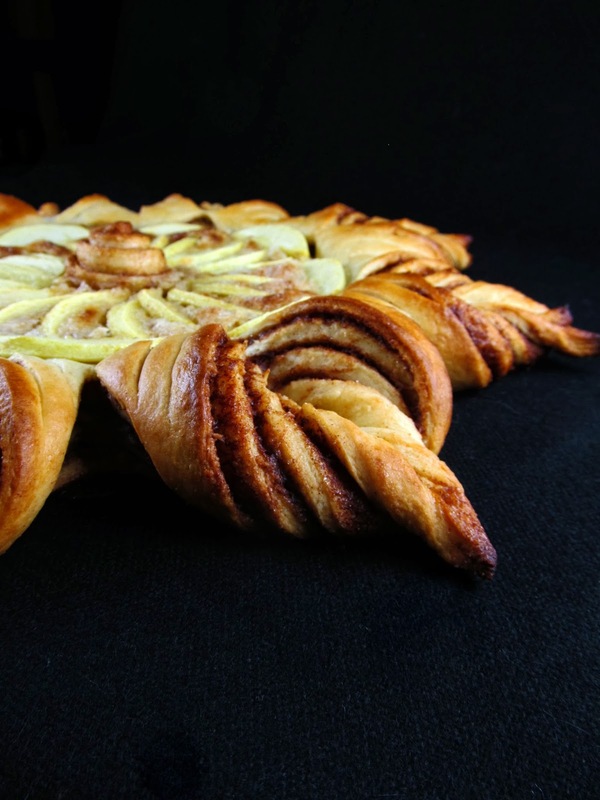 Press the apple slices gently into the frangipane, overlapping slightly in a spiral pattern. 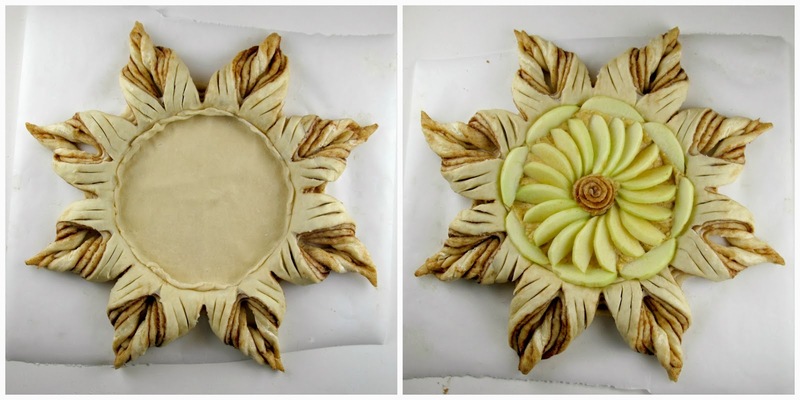 Use your trimmings from when you rounded out your dough to created a little spiral flower centerpiece. Brush the dough with milk. Sprinkle the apple section with a teaspoon of sugar. Bake for 10 minutes, then lower the temperature to 350°F and bake until the under side is golden brown and the top is as brown as you want it. Turn off the oven and let it rest in there for up to 30 minutes so your frangipane sets up and the apples cook. You may also choose, as I did, to cover the bread areas with foil and broil the apples section briefly so it browns. (I will also note that I baked my bread on a preheated pizza stone, because it's the only pan I had large enough for this bread. This may have helped brown the bottom of my bread, which happened beautifully). Take your bread out of the oven and and brush with melted butter while still hot. Stunning! Now I need to bake more bread and try this design as well. This looks so good! I would have never thought to turn the pieces around. Holy crap. Your bread is like, the most beautiful food I have ever seen. Fantastic job with this challenge. Gorgeous, I have no other words! I love the apple centerpiece and the flavours. Let me tell you, this is just a masterpiece. I love making bread but have never attempted anything but just a few leaves. You have my utmost respect! Absolutely stunning - this looks gorgeous and delicious! I'm trying to think of an excuse to make this and show it off! Beautiful!! Just found this on Pinterest and am so glad I did. Hopefully mine will turn out half as lovely as yours! I just made this and it was much easier than I expected and came out beautifully. (I did cook it too long - but that's my error. When you're cooking it keep an eye on it so it doesn't over brown).